Leveraging multiple managed DNS services to ensure optimal DNS redundancy is quickly becoming a best practice for enterprises of all sizes. DNS (Domain Name System) remains the most critical aspect of your network’s availability. When DNS services are halted, or slowed down significantly, networks become inaccessible, leading to damaging losses in revenue and reputation for enterprises. 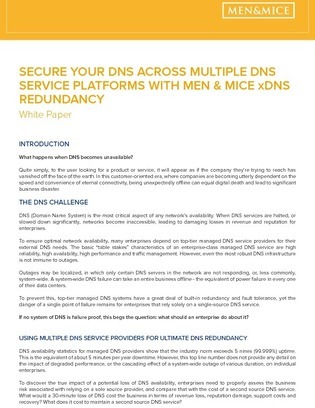 Let this white paper guide you towards a more secure and reliable DNS infrastructure.